Premium Members can gain access and exposure to industry heavyweights! 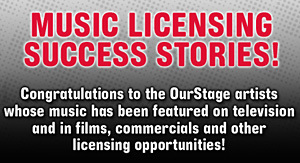 OurStage has successfully launched May's "Artist Access" Competition, which will guarantee one Premium Member selected from the top twenty in this Premium Music Channel access to industry pros. Each month one OurStage artist will be invited to NYC to meet face-to-face with an industry veteran who will provide honest and invaluable advice for this independent artist who is looking to have a career in music. Beginning April 23rd, OurStage is giving rock, pop, country and urban premium members in the April "Artist Access" Music Competition a chance at winning a mentoring session with music industry consultant Bruce Tyler. While Tyler's resume includes being the former EVP of both Sony Music and Columbia Records, he currently employs his entrepreneurial expertise to some of the most influential companies and artists in music. Whether it's working alongside major record labels, artist managers, music producers, radio giants, leading music Internet sites or some of the biggest artist in music today, Tyler is widely considered one of the music industry's best resources. Tyler's music career spans over twenty-five years and includes having a hand in the success of artists like John Mayer, John Legend, Aerosmith, Lenny Kravitz, The Fray and many more. Artists must be eighteen (18) years of age or older at the time of entry. Individual artists or a band member must be a legal resident of the 48 contiguous United States. Submission materials that are determined, at the sole discretion of the Sponsors, to be classified as rock, pop, country or urban will be eligible. Enter now for your chance to perform on the main stage at Capital Hoedown Country Music Festival! Blues Artists, Win A Year’s Supply of Free Strings & Accessories From Ernie Ball!